In September 2014, the Memorial Foundation for Children Teaching Gallery, located in the MWV Art Education Center, was be transformed into an interactive exhibition where visitors can explore daily life in imperial China. Visitors were able to interact through activities that include writing Chinese characters on a touch screen and designing personal, virtual seals. There were also be opportunities to unroll and view reproduction scrolls, like those featured in Forbidden City and in VMFA’s East Asian collection, or play traditional musical instruments and games. Whether visiting as part of a school group, or a multigenerational family, the Teaching Gallery exhibition offered visitors of all ages a new perspective on China’s imperial past. This was massive project that required a large team to get all of the components together. The images on this page don’t do these experiences justice and I highly encourage you to use the button below to go and interact with these fantastic additions to the exhibit. I had a hand with every portion of these interactives and had a large hand in building the scroll interactive. 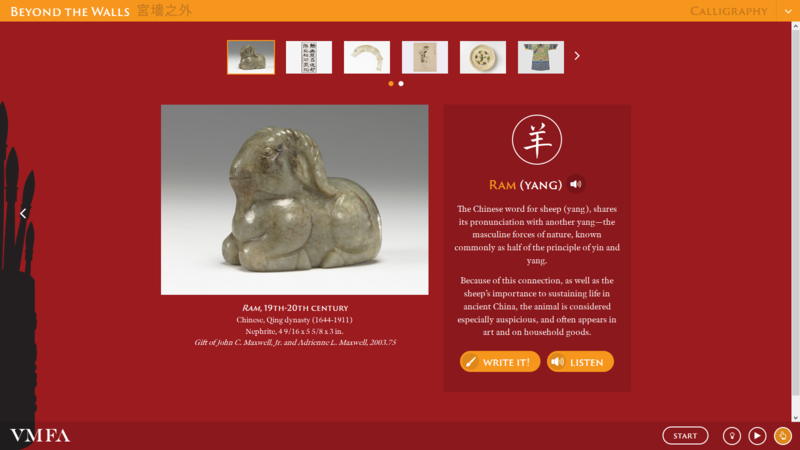 These interactives launched with the exhibit and received praise from visitors and VMFA staff alike.